Two years after the catastrophic tidal wave that swept over Japan, police officer Kiyomasa Senji is trying to make the world a safer place. Using his Branch of Sin powers, he stops criminals in whatever ways he can. After rescuing a boy named Izuru Tsukiyoshi from a gang called Goreless Peace, the conflict between Kiyomasa and his adversaries heats up rapidly, to the point of being explosive. Offering a glimpse into the past of the future Deadman, the story follows Senji, helping to further develop the reasoning that drives his actions later in life. The Deadman Wonderland OVA is an anime-original story that is only referenced in the original manga. Ok, whether or not there will be a 2nd season of "Deadman Wonderland" or not, one thing is sure, this OVA is what it is said it is, very obvious that this OVA is simply a prequel spin-off of the original anime and it focuses on Senji Kiyomasa's past, just the plot alone is good enough to such point that this OVA has a potential to be a full length anime in terms a prequel from the original "Deadman Wonderland" anime , so for the story I'll give it a "Good" rating of 7. For the art, well, since the art used is the same as the original anime I can only give it a "Mediocre" number 5, and same goes for the sound since the same opening theme is used. As for the characters, only Senji, Kiyomasa is the most prominent one since we've known that character from the original anime. As for the other characters of this OVA, they all have potentials too if this were a full length anime . It goes to show that Senji, Kiyomasa does have the potential to be a main protagonist if such anime spin-off is possible, so a "Good' rating number 7 will do. SSSLICE!!!! Enjoyment and Overall: Good No.7. Ok, so even if it is just a one off OVA, and it is more of a prequel/spin-off it did not sway away from the original anime's genre which is sci-fi, action, horror and superpower. In fact a prequel spin-off is a good idea, since it'll be alright to do away the original cast from original anime and just leave Senji, Kiyomasa to star in it together with the other cast of the OVA, that way there will be no ending left hanging, but we just have to be contented with the OVA co'z it seems that it is just limited to that, SSSLICE. This is a mini-review since it's roughly 30 minutes long, and there are some minor spoilers. There's not a lot to say about this one. 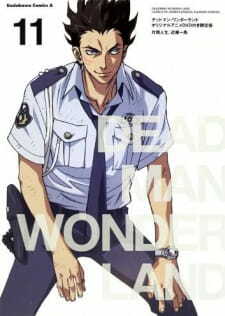 It's a short OVA that focuses mostly on Senji and his days as a police officer before he got sent to Deadman Wonderland. It reveals some backstory, but it doesn't solve the underlying problem of Deadman's story being criminally incomplete. It's backstory and nothing else. It's got some of Deadman's trademark action, yes, and it's always fun, but this OVA isn't much at all. I do allude a bit to the quality (though not the content directly) of the main series' ending in this review. Right from the beginning I had a strong suspicion that nothing good would come from watching this OVA. The original series was just disappointing, after all. Of course, I didn't realize when I started watching that it was called "Red Knife Wielder," which would have pretty much let me know that it would do nothing to actually tie up any lose ends left in the original series. Worse than not completing anything that was started in the series, it didn't even provide some hint as to how Senji becomes how he is depicted in the original. In fact, it starts relatively similar to how he acts in the show but he actually grows in the opposite direction of his main-series nature. In short, watching this added no value or depth to something that was already in desperate need of both. This review can contain some spoilers. English is not my native language so, excuse my grammar errors. Well, I finished this OVA the same day I finished the anime of DW. Now, where shall I begin? This OVA presents us Senji (aka Crow) as the main protagonist and it focuses in his past. Pretty interesting, huh?. Sadly, this was nothing but a complete filling OVA. There can be some scenes that are not filling but almost all the OVA was it. There are many characters that do not appear in the manga, although some of them were created to give more depth to Senji's personality and relationships, most of them didn't add anything to the plot and left the main story as inexistent. Keigo is the perfect example because the main antagonist of the OVA it should have been Ikazuchi Akatsuki. If you readed the manga you will realize that Ikazuchi was the main responsible of the dead of Senji's comrades and his imprisonment. However, all Ikazuchi's time on screen was overshadowed by Keigo leaving Ikazuchi as a background character that did... nothing. Because of this, the part where Senji was accused and imprisoned is not shown. I think Senji and his comrades were the only thing that prevented to give a lower score to the OVA. This OVA promises but fails. You can consider it just as a "wasted potential" OVA. Watch it under your own risk. Does anyone know where this will fit in?